The Pittsburgh Review-Tribune appears to have found some of Rachael Ray's biggest fans. 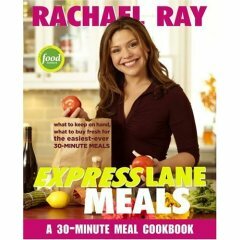 They asked readers why they were "smitten" with Rachael Ray in anticipation of her appearance at a book signing for Express Lane Meals. The article features several Rachael Ray fans talking about why they like her so much and why she has such broad appeal. He's not just goofing off, Johnson says. His workplace is a dialysis clinic, and he watches Ray on the community television as he takes care of his patients. Johnson doesn't cook. He doesn't own a Rachael Ray cookbook. His wife doesn't cook, either. They don't even have cable at home, so the Stahlstown man has to get his fix at the clinic. What is it about this woman? "I love food, and I like to watch people making it," Johnson says. "Most of the time, the people on television making the food are not the most attractive people in the world, but when it comes to Rachael, she can bring home the bacon and fry it in the pan." His obsession -- which dates back two years -- includes pasting pictures of her on the sides of computers attached to the dialysis machines. Patients even bring Johnson photos of Rachael they tear from magazines, he says. "She has a good attitude, very chipper all the time." I own almost all her cookbooks and cook her recipes almost exclusively, so maybe that makes up for me not "pasting pictures of her on the sides of computers."